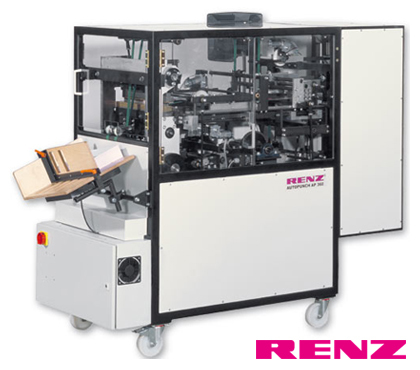 The Renz AP360 Digital is a heavy-duty, high-speed, professional, automatic, floor standing, auto-punch machine with auto set up touchscreen control. It is made for a large range of book and calendar punching production. - Touch screen assisted set-up process with job memory. - Two finger paper pick up system which can handle a range of mixed stock. - Wheels allow the machine to be moved easily. Size: 78.7" L x 47.2" D x 63" H / Weight: 1,496 lbs.